WE ARE NOW CLOSED FOR THE DAY DUE TO INCLEMENT WEATHER. We’ve decided to cancel our Praise + Pick event scheduled from 4 pm to 9 pm on Friday, April 19th due to inclement weather. We will still be open our regular business hours beginning at 9 am, however the severe weather is expected to begin in the afternoon and last throughout the early evening. Once the storms in the area begin, we will close our fields for picking. Please plan to come earlier in the day for picking on Friday. Thank you and have a great day! • Blueberry, peach, sunflower and zinnia picking. • Rooftop deck to enjoy the beautiful sunset at the farm. • Blueberry donuts, cobbler, muffins and more seasonal treats from our bakery, Southern Hill Sweets. • Picnic tables. First come, first served. • Visit our Things To Do for more information about our spring u-pick. • Complimentary admission and parking. • $4/lb u-pick blueberries and peaches. 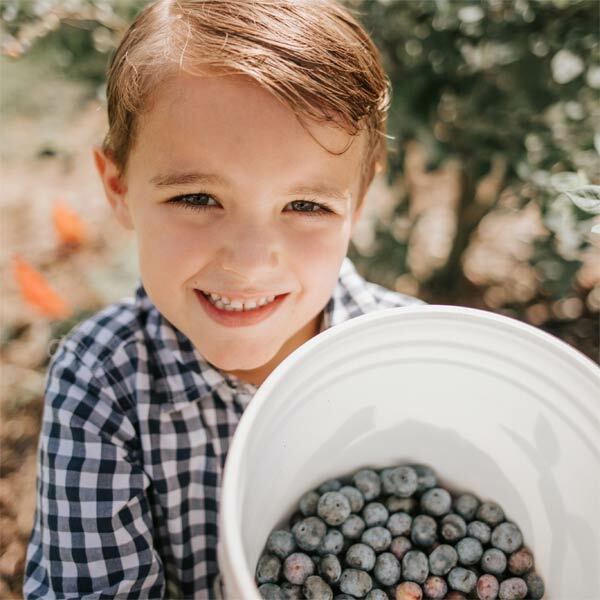 • $5/lb pre-picked blueberries (packaged in 2 lb clamshells). • $2/lb frozen blueberries (packaged in approximately 4 to 5 lb bags). • $2/stem sunflowers, $1/stem zinnias. • You’re responsible for paying for everything that you pick. • Cash, debit and all major credit cards accepted. • Due to Federal and State food safety regulations there cannot be animals of any kind on the farm or in the blueberry fields. • No outside alcohol, coolers and catered meals. • Schofield Road is a Lake County clay road. • Southern Hill Farms is a working farm, you will be parking and walking in grass and unpaved areas. • All events are subject to change or cancellation due to inclement weather and crop availability. • Always check our website on the day of your planned visit for final event details. • Address – 16651 Schofield Road, Clermont, FL 34714. • Hours – Tuesdays through Sundays, 9 am to 4 pm through May. • View directions to the farm. Under Florida law, an agritourism operator is not liable for injury or death of, or damage or loss to, a participant in an agritourism activity conducted at this agritourism location if such injury, death, damage, or loss results from the inherent risks of the agritourism activity. Inherent risks of agritourism activities include, among others, risks of injury inherent to land, equipment, and animals, as well as the potential for you to act in a negligent manner that may contribute to your injury, death, damage, or loss. You are assuming the risk of participating in this agritourism activity. Chapter 2013 – 179. Section 570.96.